The I Am Alone, flying a Canadian flag, was a rumrunner sunk by Coast Guard patrol boats in the Gulf of Mexico in March, 1929. The USCG knew that the ship was not a Canadian owned-and-controlled vessel but the proof went down to the bottom of the ocean when it was sunk. The Canadian Government sued the United States for $365,000 and the ensuing legal battle brought world-wide attention. 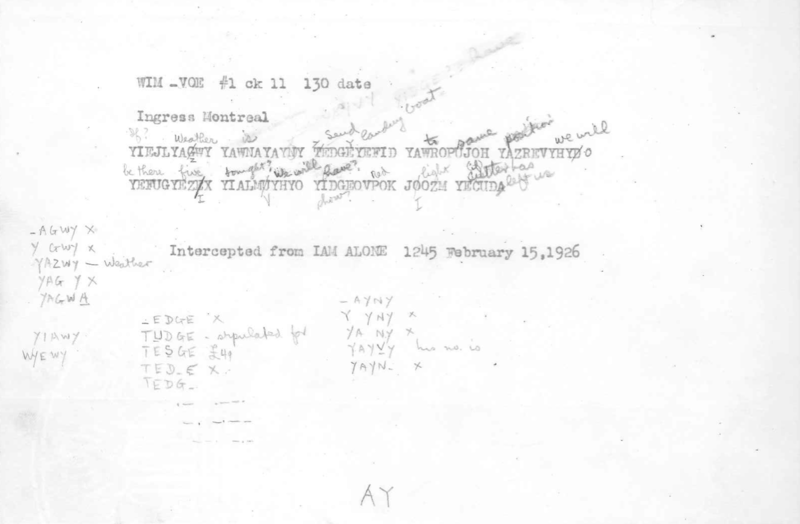 Elizebeth Friedman decoded the messages transmitted by the I Am Alone, and those messages proved that the boat was, in fact, not a Canadian owned-and-controlled vessel. The case actually went to a Commission, whose final report was issued in 1935. They found, thanks in part to Elizebeth Friedman, that the owners and controllers of the vessel were not Canadian and used the boat primarily for illegal purposes. The image below is a scan of an intercepted message, dated 1926-02-15, from the I Am Alone. The writing is that of EF and you can make out her (mostly) deciphered message. “Listening to the rumrunners” by David Mowry, 2001. This entry was posted in cryptography, math and tagged Elizebeth Friedman, Marshall Foundation, prohibition. Bookmark the permalink.